The Greene Space presents MALCOLM X: SPEAKING IN THE 21ST CENTURY, bringing together individuals connected to various facets of Malcolm X’s life who have never before shared a stage: PETER BAILEY, former associate editor of Ebony and an original member of the OAAU; ILYASAH and MALAAK SHABAZZ, daughters of Malcolm X; EARL GRANT, a close associate and one of the last people to see Malcolm X alive; and DR. MUHAMMED AHMAD, Assistant Professor, African American Studies, Temple University. The evening will be hosted by FARAI CHIDEYA, award-winning author and journalist and contributor to WNYC and Public Radio International’s morning news program, The Takeaway. 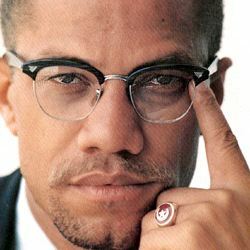 These close colleagues and family will not only remember Malcolm X’s contributions to the 20th century American and global landscape, but will position him squarely in present political, social and cultural discourses, as well. This lively conversation will be interwoven with a multimedia collage of audio and video excerpts of Malcolm X, as well as exclusive video footage of Mr. Bailey at the Audubon Ballroom, recounting the timeline leading up to Malcolm X’s assassination. The event will be presented as a live videostream at www.wnyc.org/thegreenespace, and the panel will address questions from both the live and online audiences. New Yorkers who have memories from Malcolm X’s time will also have the opportunity to swap reminiscences online (web address to be announced at a later date). Farai Chideya, has combined media, technology, and social justice during her 20-year career as an award-winning author and journalist.. From 2006 to early 2009, she hosted NPR’s News and Notes, a daily national program about African-American and African diaspora issues. She and the teams she has worked with have won awards including a National Education Reporting Award, a North Star News Prize, and a special award from the National Gay and Lesbian Journalists Association for coverage of AIDS. Chideya’s novel Kiss the Sky is nominated for a 2010 NAACP Image Award. She is a contributor to The Takeaway, a morning drive news program co-produced by WNYC and Public Radio International, in editorial collaboration with the BBC World Service, The New York Times, and WGBH Boston. Peter Bailey, former associate editor of Ebony magazine was an original member of The Organization of Afro-American Unity (OAAU), founded in 1964 by Malcolm X. Bailey was editor of the OAAU newsletter Blacklash. He is also is co-author of Revelations: The Autobiography of Alvin Ailey; co-author with Rodnell P. Collins (nephew of Malcolm X) of Seventh Child: A Family Memoir of Malcolm X. He assisted John Henrik Clarke with the editing of Malcolm X: The Man and His Times. Mr. Bailey has also authored Harlem: Precious Memories; Great Expectations and is the former President of the New York Association of Black Journalists. He is a native of Columbus, Georgia and a graduate of Howard University. Malaak Shabazz is the youngest daughter of Malcolm X and Dr. Betty Shabazz. When Malcolm X was gunned down in the Audubon Ballroom on February 21, 1965, Malaak was still in her mother’s womb. Together with her sisters, Malaak oversees the The Malcolm X and Dr. Betty Shabazz Memorial and Educational Center in Harlem, which honors the legacies of her parents by promoting human and civil rights through knowledge of the history and culture of the African Diaspora; education and self-empowerment; family values; and facilitating racial and religious reconciliation. In keeping with her father’s late-in-life internationalism, Malaak works at the United Nations, focusing on aid to women and children in developing nations. Dr. Muhammad Ahmad (s.n. Maxwell Stanford Jr.) was national field chairman of the Revolutionary Action Movement (RAM) during the mid 1960’s and founder of the African People’s Party in the 1970’s. Dr. Ahmad has worked closely with Malcolm X. In 1968, he helped organize the Third National Black Power Conference and co-chaired its political workshop. Ahmad taught African and African-American history and political science in Ohio for 16 years. He is assistant professor in the Department of African-American Studies at Temple University in Philadelphia. Ahmad has recently authored 3 books: Selected Writings, vol.I, We Will Return in the Whirlwind, and African-Americans since 1900: 2nd edition. MALCOLM X: SPEAKING IN THE 21ST CENTURY is the first installment of The NEXT New York Conversation: Legacy 2010, a dialogue series exploring the lives of significant figures – from Malcolm X to John Lennon, among others – whose work has transcended time and place and continues to impact us today. Produced and presented by The Greene Space, WNYC’s multiplatform street-level performance venue, Legacy 2010 convenes historians, scholars and eyewitnesses of history to examine the ongoing relevancy of thinkers, newsmakers, changemakers in an intimate setting with a global reach. Going beyond biography, the interactive series will engage both live and online audiences to bring to life the way these luminaries continue to shape our world, inform global dialogues and touch us personally.